Drive-by downloads are programs that are automatically sent to your computer when you visit certain websites or view HTML e-mail messages. The download happens without your consent and is a very common method for spyware and adware to get on your system. This type of invasion is worse than a pop-up download where at least you have the choice of cancelling. One simple step that you could take to minimise drive-by downloads is to make sure that the security setting for the browser you are using is set high enough to be able to detect unauthorized downloads. 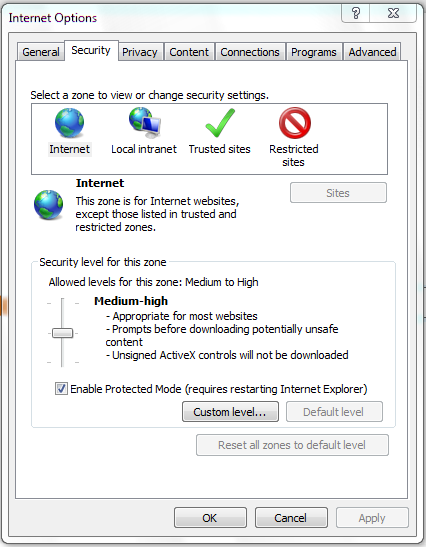 For example, if you are using Internet Explorer your security setting should be at ‘medium’ as a minimum. This can be done by clicking on Tools > Internet Options > Security and the the Default Level button as shown at the right. We’ll take a closer look at browser security settings in Outcome 3.